Xe Om, Pho: Dear Phil - a project! Dear Phil - a project! I like cooking, but I realise that I've been a bit lazy about learning how to cook Vietnamese style food. I was reading this column by Sheila Quirke and she mentioned an idea she once had of learning about one country in Africa per week - since the number of African countries is similar to the number of weeks in a year. She failed - but it's still a cute idea. 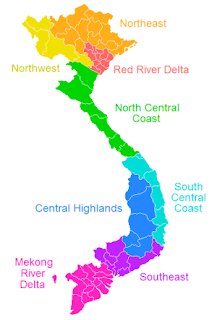 I wondered how many provinces are there in Vietnam? Close to a year. I could learn one dish from each province per week, I suppose. But that sounds overly ambitious. I don't want to fail like Sheila did, just because I set the bar too high! And, although lots of provinces have their own specialities, I'm not sure if they all do. I could end up making an awful lot of stringy chicken stewed in lemongrass and ginger, y'know? Vietnam has a mere 8 regions. And it does seem achievable that I could master one dish from each region roughly over the course of a year - say, one per month-ish. Are you hungry, Mr Martin? Sorry to use the comment function on your blog to contact you but I couldn't find your email address. I am an editor at www.expatarrivals.com and I am looking for expats to contribute to a guide on Ho Chi Minh City guide. I am keen to have someone write a page on HCMCs best restaurants. Would you be interested ? In return for your hard work I would give you a expert profile box which you could use to promote your blog to a wider expat audience. Please email me on shantalie@expatarrivals.com for more information.